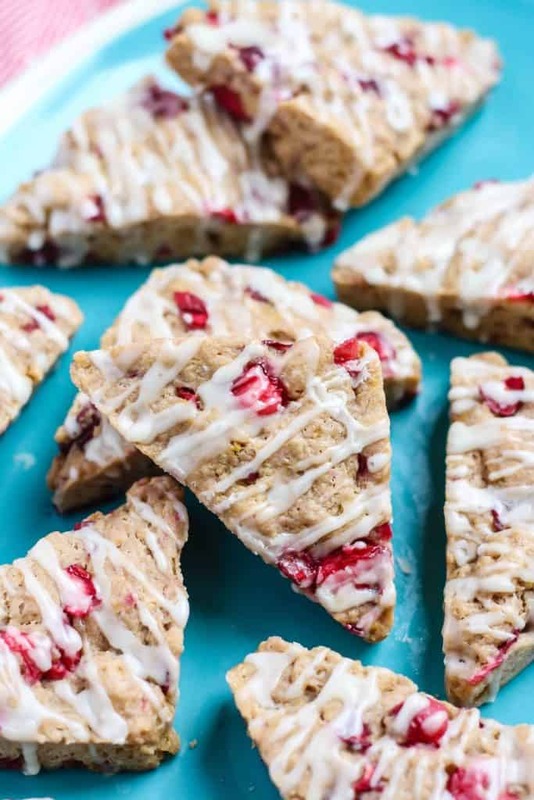 These Vegan Cranberry Orange Scones are lightened up but packed with flavor! Whole wheat white flour, coconut sugar and coconut oil make for a healthier, dairy-free breakfast treat. 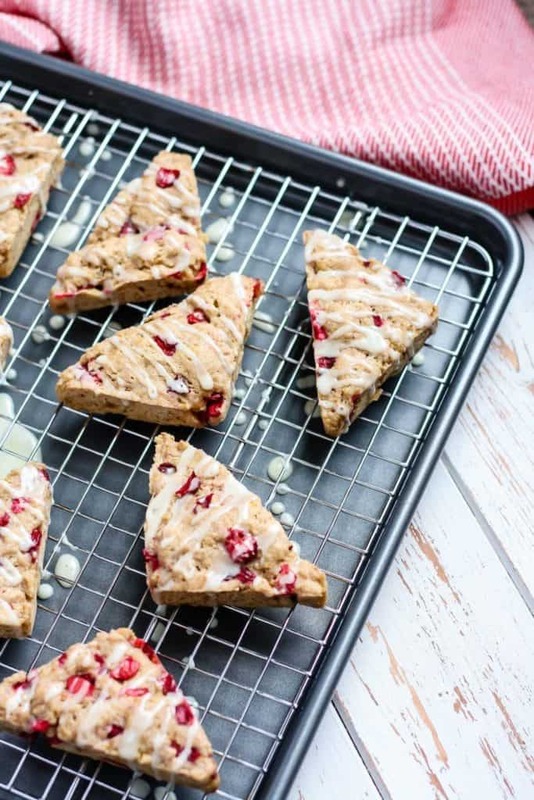 Let’s start off this week with some scrumptious vegan scones shall we? That’s right, these are VEGAN. Which means no butter or eggs in these gorgeous little treats. And they don’t even have an “egg replacer” (i.e. flax egg) so they’re super simple and the dough comes together in just minutes! I actually started with my original dairy-free scone recipe and made some adjustments from there. I had a feeling I could make these scones vegan by just replacing the egg with a little more coconut milk, and I was RIGHT. The texture is ever-so-slightly different in comparison to the original recipe, but you’d never actually guess these were vegan scones. 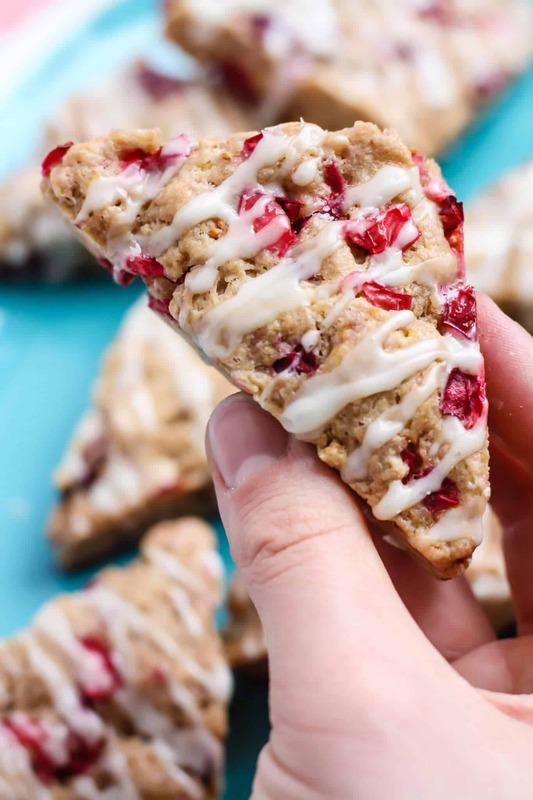 I am seriously loving using cranberries in baked goods lately. Ever since my Cranberry Orange Bundt Cake I’d been dreaming up these scones. And then my Pal bought me this cute little scone pan* for my birthday, so OBVIOUSLY I had to test it out. If you don’t have a scone pan, DON’T FRET. You can still follow the instructions in my original recipe with step-by-step photos here. The process for mixing the ingredients is the same, you’ll just shape your dough into a circle at the end, slice and bake. Easy change, promise. Of course we can’t forget about the topping for these. Cranberry orange scones NEED a sweet orange glaze. It’s basically an unwritten rule. 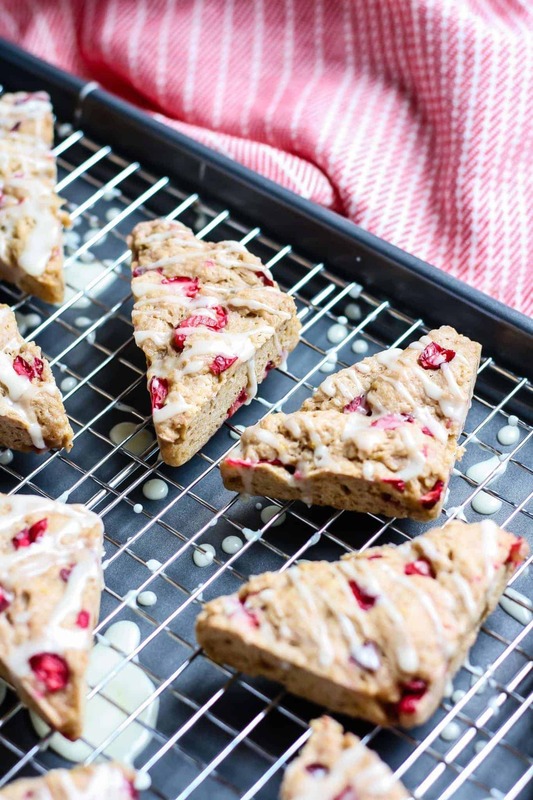 These Vegan Cranberry Orange Scones are lightened up but packed with flavor! Wholesome ingredients make for a healthier, dairy-free breakfast treat. Preheat oven to 350F and grease scone panlightly with coconut oil. Set aside. In a large bowl, add flour, sugar, orange zest, baking powder, and salt. Stir until well combined and set aside. Grate your ½ cup of frozen coconut oil into large bowl of dry ingredients. Using dough blender, work coconut oil into flour mixture until a grainy, meal texture forms. Pour in coconut milk, add in almond extract and gently combine, without overworking the dough. Then gently fold in chopped cranberries. Distribute dough evenly into mini scone pan (you should be able to fill each cavity evenly) and bake for 15-20 minutes. Check for doneness at 15 minutes by inserting toothpick in middle of scone, toothpick should come out with little to no batter. (My scones took 18 minutes.) Allow scones to cool in pan for 5 minutes. To make glaze, combine powdered sugar and start with 1 TBS or orange juice. Add more OJ a very small amount at a time, until desired consistency is reached. Transfer scones to cooling rack with baking sheet underneath. Drizzle glaze on scones, as much or as little as desired. Scones are best when served fresh. *Half whole wheat, half unbleached all-purpose SHOULD work, but I have not tested this myself. I do NOT recommend using all whole wheat flour, as they will most likely turn out dense and dry. *To freeze coconut oil, measure out in 1/2 cup, then transfer to large bowl and freeze for at least 1 hour. -Store scones in airtight container up to 3 days fresh, or 5 days in fridge. Un-glazed scones will keep in freezer wrapped tightly and stored in container up to 1 month fresh. -Recipe adapted from Whole Wheat Coconut Scones. To make regular large scones, shape dough into large circle, about 8″ in diameter, on lined baking sheet. Using a large, sharp knife, make 8 triangle slices into dough and bake for 17-20 minutes, then remove from oven to re-cut slices and pull apart triangles slightly. Bake for another 5 minutes, until edges and tops are lightly browned. Making something from FMK? Don’t forget to tag me on social media and use #fitmittenkitchen so I can have a looksee ? I LOVE seeing what you’ve made ? Vegan baking ain’t all that bad 😉 Thanks so much Taylor! I love everything about this post! The flavors, use of coconut milk, and photography 🙂 yay! Hmmm what type of scones next? Have you done blueberry lemon yet? I have NOT done a blueberry lemon, lovely suggestion. Thanks, Jess! 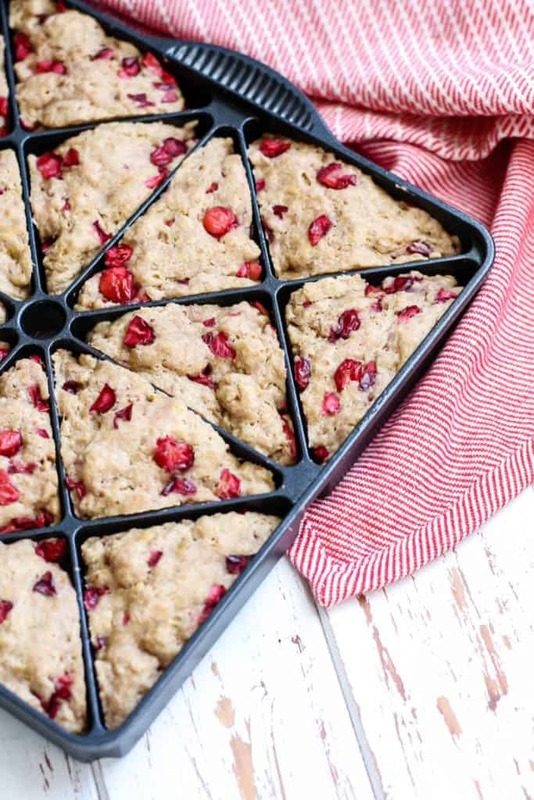 Wait… you have a scone mold? Is that what it’s called? I didn’t even know those existed! So cooooool! Love the cranberry-orange flavor combo alwayssssss. i love that scone pan, I must buy!!! These are gorgeous and need to be dunked in some coffee for the most perfect on the go breakfast, yum! Cranberry + orange are a match made in heaven! These look SO good, I can’t believe they are vegan. And that pan is brilliant! I can’t believe these are vegan. My doctor just told me I need to give up eggs for awhile. And I totally need that scone pan. Where did she get it? A scone pan!!! I’m jealous!! Haha! That’s fantastic! Yes, it is super neat. Oh EM gee! I need a scone pan! These are so gorgeous. And the flavor combo is one of my favorites! A SCONE PAN? WHAT THE WHAT? Excuse me while I go purchase one now. These are beautiful – look at us today with our fruit + citrus flavor combos! YAY fruit citrus blends! They just make for the greatest flavors in baked goods. And yes, BUY ONE. It’s awesome. Um how freaking brilliant are you?? Gah! 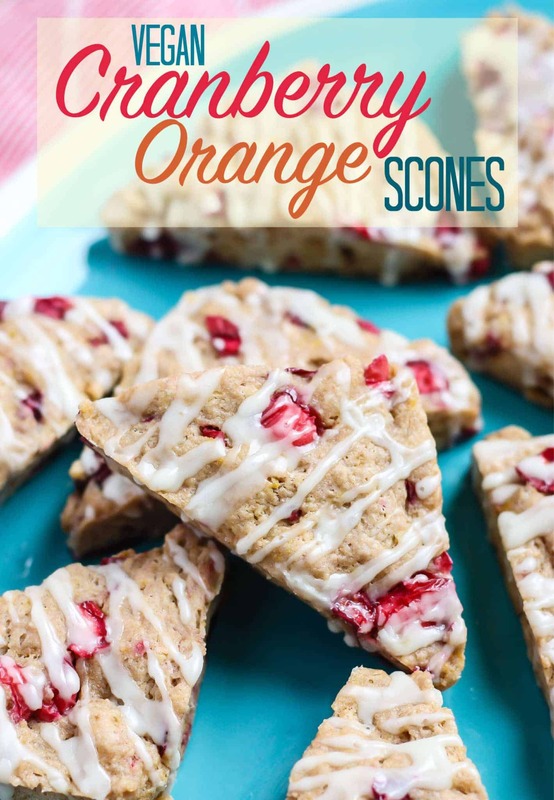 Cranberry orange is like my favorite combo (at least when it comes to baked goods!). My mom used to make something that came from a box when we were little, so I think it’s a nostalgic thing! Looks great. Baking memories are the best 🙂 Thanks, Sarah! What an awesome recipe! 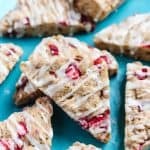 I love cranberry scones. Can’t wait to try it. And who knew there was a scone pan? Fun! What lovely scones!!! I love the flavor combination! And that cute pan, too! These looks super delicious. Yummy! Thanks for sharing! I saw your post on instagram and I really need to make these! They look awesome! How are these so cute, and this awesome scone pan and OMG!! Send me your leftovers. Please and thank you 🙂 Pinning of course, can’t wait to try this recipe! Girl, these photos are gorgeous!! Cranberry + orange is one of my favorite combos. These look incredible. I used to make a strawberry orange muffin that reminds me of this recipe. I’ve never attempted making scones but I think you’re convincing me! Goodness gracious, these look delicious…and that scone pan- I NEED! It’s definitely a nice pan to have. Necessary? Maybe not. Fun? Absolutely. 😉 Thanks Annmarie! Quick question. I don’t have a scone pan so I didn’t the circle and cut method and I have been baking them for almost 40 minutes and they are still not fully cooked in the middle. Our oven is not broken and I actually upped the temp to 400 degrees. I know scones are supposed to be soft, but the middles are still really wet in the center. Any suggestions or has anyone else experienced this? Thanks. Hi Nicki – I’m sorry you’re having trouble with the recipe! I don’t believe anyone has had this problem that I am aware. Did you use frozen oil and frozen cranberries? Hi Lynn! 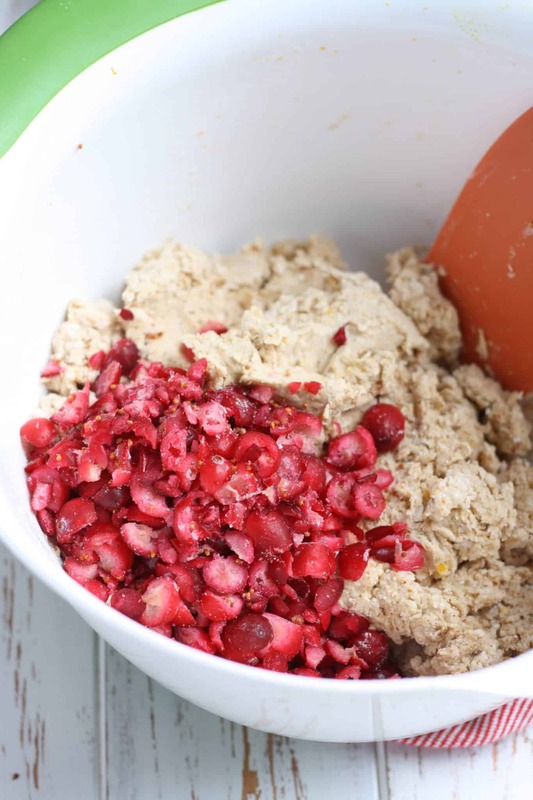 Fresh cranberries will work – the frozen ones just help keep the dough cold and are a little bit easier to blend in with the dough. But you can use fresh if that is what you have on hand!